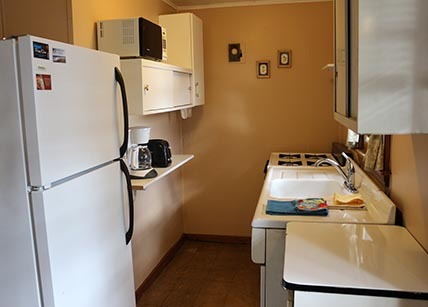 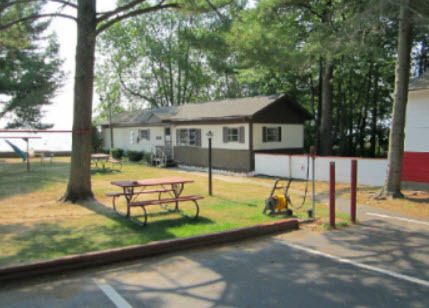 The Lodge is a fully furnished two-bedroom home and is perfect for large families and has a full kitchen with refrigerator, freezer, electric range, oven, microwave, coffee maker and toaster. 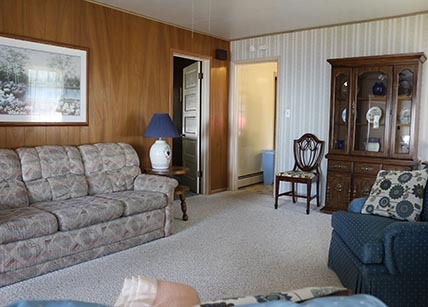 The spacious living room and sunroom have newer carpeting. 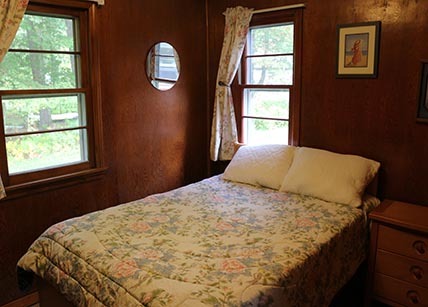 There is a futon in the sunroom for additional sleeping comfort. 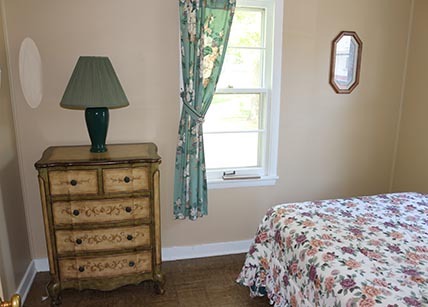 The sunroom has two large picture windows that look out over the beach. 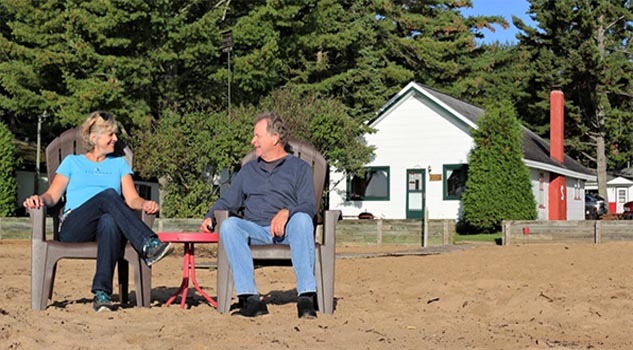 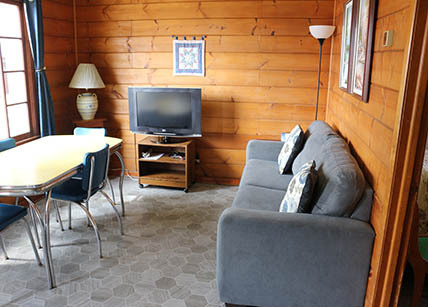 Lodge guests are just steps from the lakeshore. 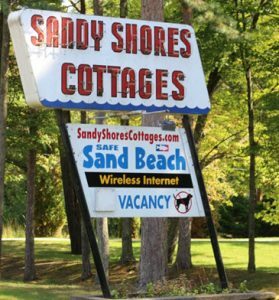 This is beach life at its best! 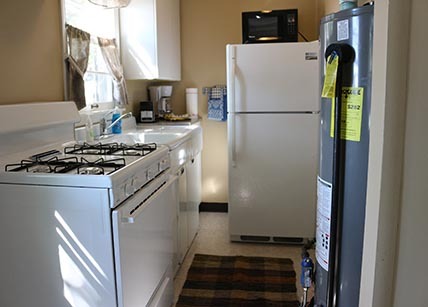 The Sunrise Suite is a fully furnished two-bedroom home with a full kitchen including refrigerator, freezer, gas range and oven, microwave, coffee maker and toaster. 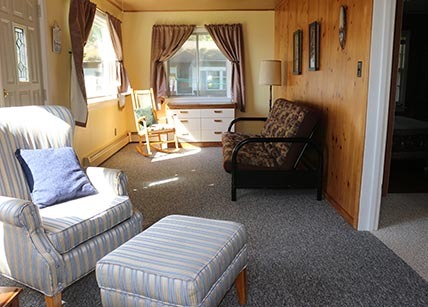 The living room has newer carpet and a new futon – 2018. 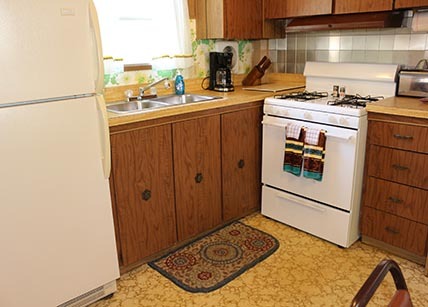 It also has a remodeled bathroom and new kitchen floor – 2017. 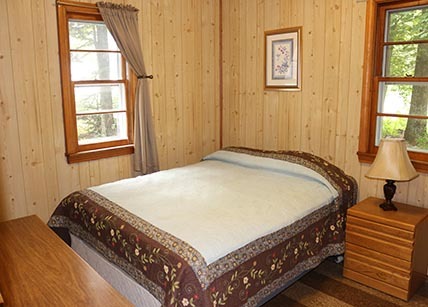 Enjoy the stunning view of the beach and lake from the master bedroom window. 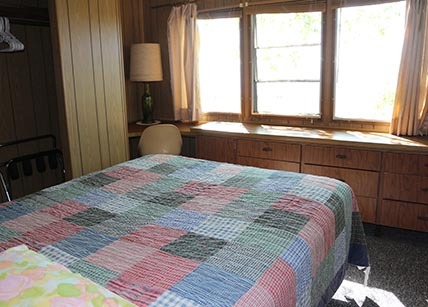 The second bedroom is at the opposite end of the mobile home. 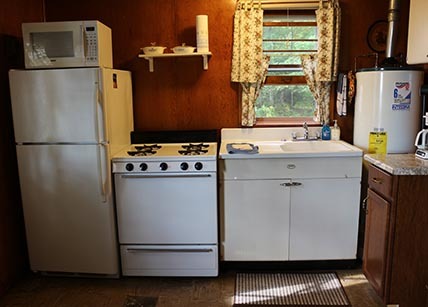 This cottage has two bedrooms each with a full-sized bed, living room, kitchen with refrigerator, freezer, gas range and oven, coffee maker, microwave and toaster. 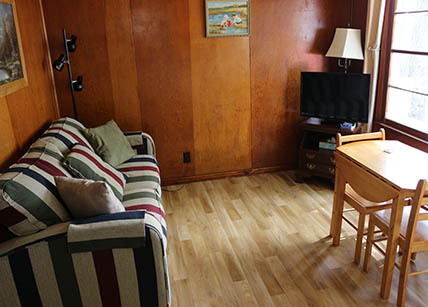 In 2017, the kitchen and living room flooring was updated. 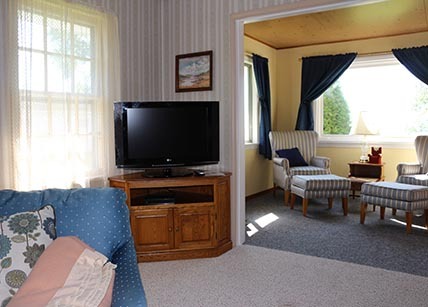 A large picture window in the living room provides an unbeatable view of the beach and lake. 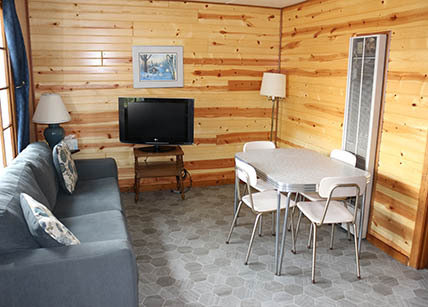 Enjoy the lake breezes, as well. 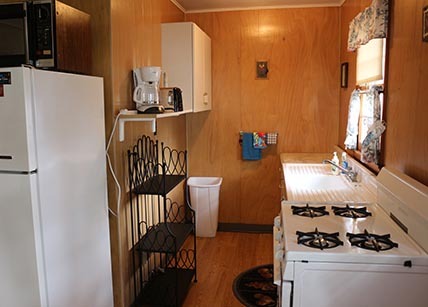 This cottage has two bedrooms each with a full-sized bed, living room with a futon, kitchen with refrigerator, freezer gas range and oven, coffee maker, microwave and toaster. 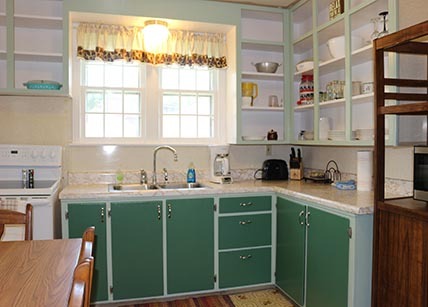 In 2015, the kitchen and living room flooring was updated. 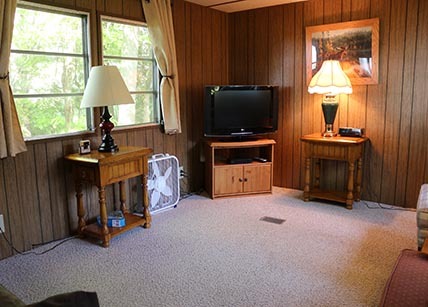 A large picture window in the living room offers a fantastic view of the beach and lake. 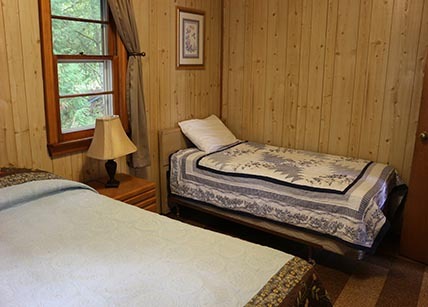 Enjoy the lake breezes, as well. 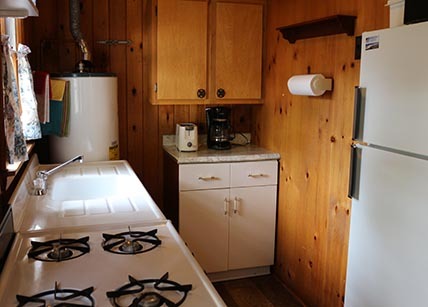 This cottage has two bedrooms each with a full-sized bed, living room, kitchen with refrigerator, freezer, gas range and oven, coffee maker, microwave and toaster. 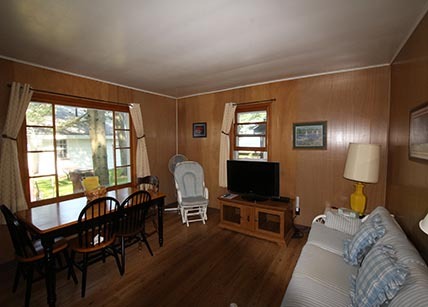 The living room is paneled and has a large picture window. 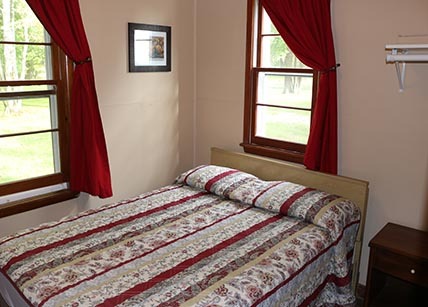 The bedrooms, bathroom and kitchen have recently been repainted – 2015. 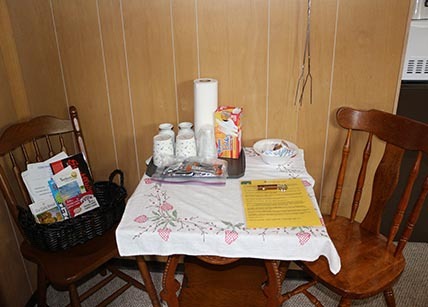 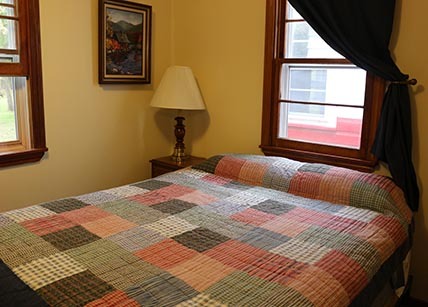 This cottage is a cozy one-bedroom cottage sometimes affectionately referred to as the “Honeymoon Suite.” It has a kitchen with gas range and oven, refrigerator, freezer, coffee maker microwave and toaster. 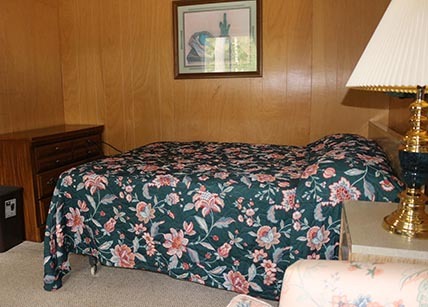 The bedroom was recently re-carpeted – 2015. 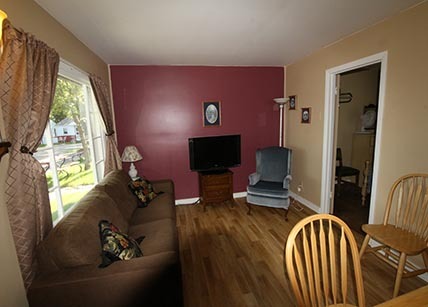 The flooring in the kitchen / living room area is new as of 2018. 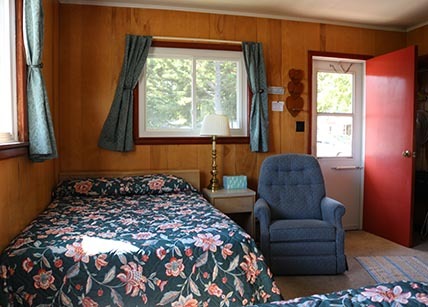 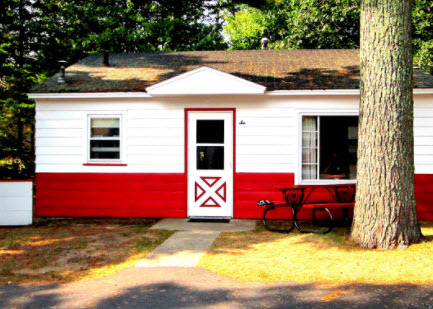 This cottage has two bedrooms each with a full-sized bed, living room with warm, wood paneling, kitchen with refrigerator, freezer, gas range and oven, microwave, coffee maker and toaster. 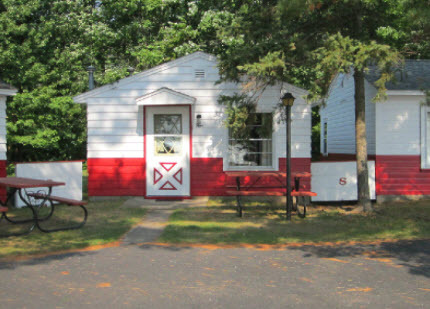 This cottage is in a shadier section of the property. 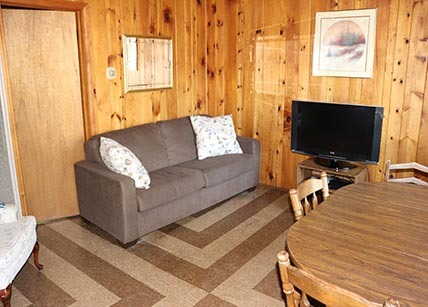 The flooring in the kitchen / living room area is new as of 2018. 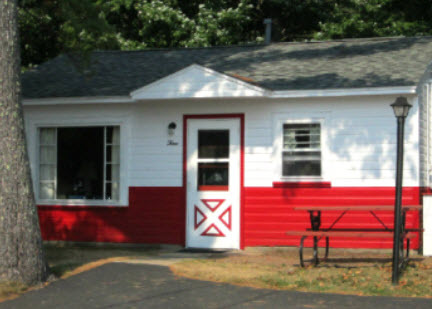 This cottage is one of our larger cottages. 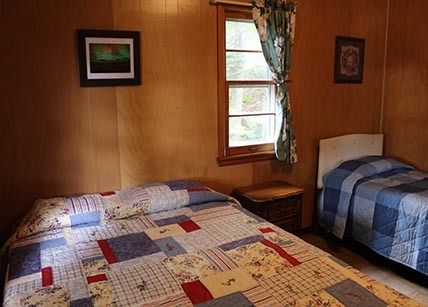 It has two bedrooms with two beds in each, a living room with warm, knotty pine walls, kitchen with refrigerator, freezer, gas range and oven, coffee maker microwave and toaster. 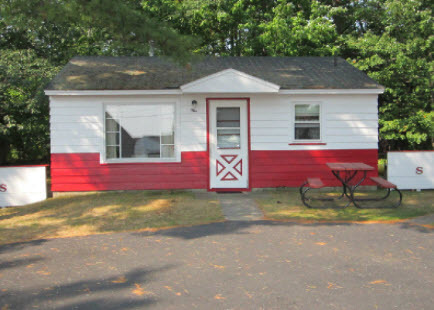 This cottage is in a shadier section of the property. 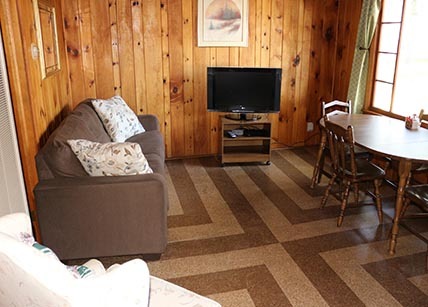 The flooring is on schedule to be replaced in the kitchen and living room areas prior to the start of the 2019 season. 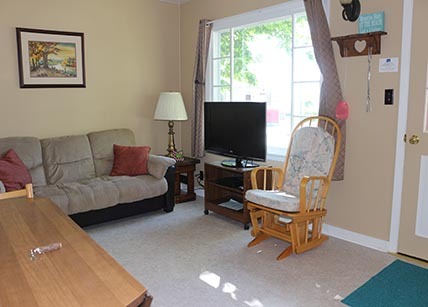 This cottage is one of our larger cottages. 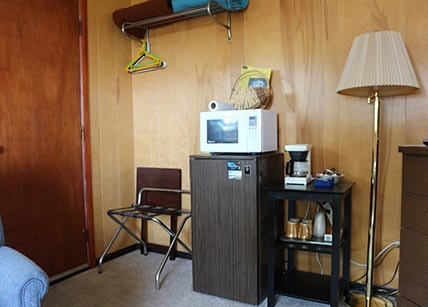 It has two bedrooms with two beds in each, a living room with light, wood paneling, kitchen with refrigerator, freezer, gas range and oven, microwave, coffee maker and toaster. 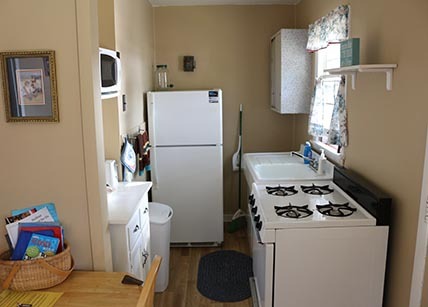 In 2017, the living room / kitchen floors were updated. 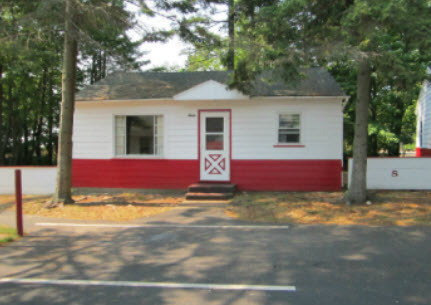 This cottage is in a shadier section of the property. 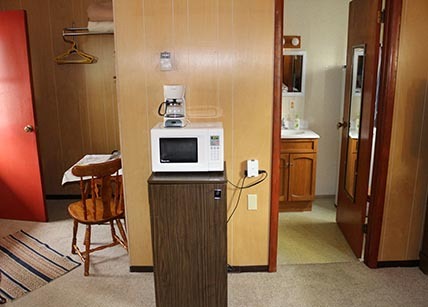 Each unit has a combined sitting area with a T.V., small refrigerator and coffee maker, microwave and bedroom with two beds. 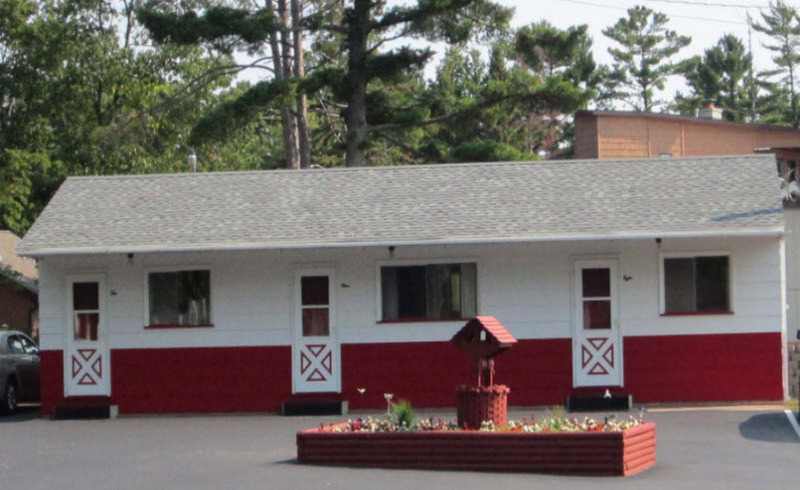 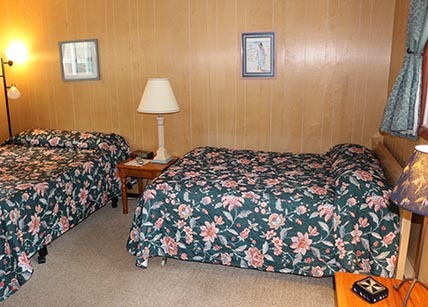 Motel 8 and 10 have two double beds. 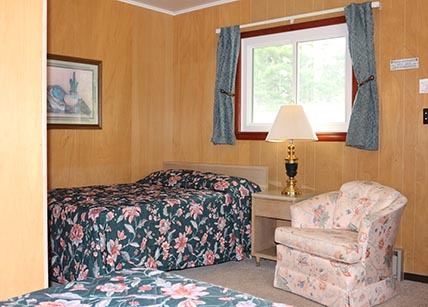 Motel 9 is slightly larger and has a queen and a double bed. 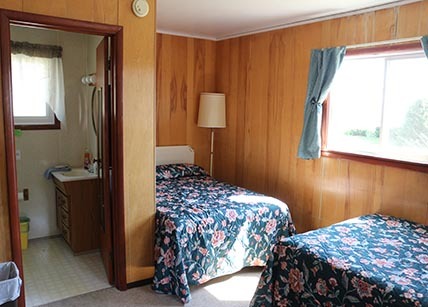 Each unit has a bathroom with full tub and shower. 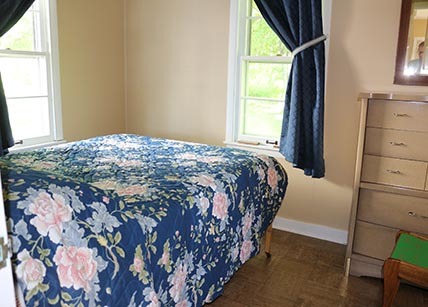 In Season Rate – $700 per week or $100 nightly.